A struggling mobile chip giant with an attractive dividend, or an expensive graphics chip supplier with growth potential? For a time, graphics chip specialist NVIDIA (NASDAQ:NVDA) was going head-to-head with mobile chip king Qualcomm (NASDAQ:QCOM). The rapid adoption of smartphones created a massive market for Qualcomm's mobile processors, and NVIDIA attempted to directly compete with its graphics-focused Tegra mobile chips. But competition was fierce, and NVIDIA eventually abandoned the mainstream mobile device market for greener pastures. While NVIDIA took a bruising in the mobile market, the company's stock has been on a tear thanks to strength in its core graphics business, as well as growth in its automotive and data center segments. Meanwhile, Qualcomm is suffering from falling revenue and profits due to a slowing mobile device market, heavy competition, and licensing issues in China. Its stock has tumbled over the past year. For those looking for an attractive valuation and a hearty dividend, Qualcomm is the clear choice. But for growth investors willing to pay a hefty premium, NVIDIA may be the better bet. Qualcomm, which earns most of its profits from licensing its intellectual property, has been in a slump. During the company's fiscal second quarter, revenue declined by 19% year over year, while adjusted net income fell 34%. Total chip shipments declined to 189 million, down from 233 million during the prior-year period, leading the chip segment to post a 77% year-over-year drop in pre-tax income. The good news is that the licensing business remains a major source of profits for Qualcomm, despite recent declines. During the second quarter, licensing revenue fell 12% year over year and pre-tax profit slumped 14%, but the segment still produced $1.86 billion of pre-tax profit. That compares to just $170 million coming from the chip segment. It's always uncomfortable buying shares of a company with declining earnings, but Qualcomm's licensing business provides the company with a fairly stable source of profits, recent issues notwithstanding. With the stock trading for around $52 per share, Qualcomm trades for about 12.7 times analyst estimates for fiscal 2016 adjusted earnings. For that price, investors also get an attractive dividend. Following Qualcomm's recent dividend hike, the stock now yields about 4.1%. Qualcomm is heavily dependent on the smartphone market, and while growth prospects exist, including the Internet of Things and ARM server chips, the company's success in those areas is far from a sure thing. I don't think Qualcomm is much of a growth stock anymore, but for investors looking for value and dividends, it's certainly a better bet than NVIDIA. 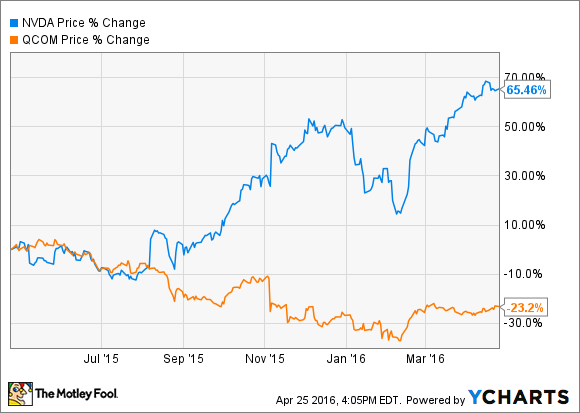 After nearly tripling over the past three years, NVIDIA is an expensive stock. Even after backing out the company's net cash position, the stock trades at nearly 28 times last year's earnings. What's more, a significant portion of NVIDIA's profits come from a licensing deal with Intel, and NVIDIA will only recognize revenue from that deal for another year before it expires. If the agreement is not renewed, NVIDIA's earnings would take a big hit. Without the licensing revenue, the company's fiscal 2016 GAAP EPS would have been 35% lower. At this point, though, NVIDIA is not a stock that's bought based on current profitability. The company is positioned to benefit from a variety of major trends in the coming years, and NVIDIA's growth potential is very real. Virtual reality, deep learning, big data, self-driving cars -- NVIDIA is involved in all of these areas. And its core graphics business is booming despite a slowdown in the PC market. During NVIDIA's first quarter, the automotive segment grew by 66% year over year, while the data center segment grew by a more modest 10%. The gaming segment, by far the largest part of NVIDIA's business, grew at an impressive 25% rate, driven by strong sales of the company's high-end graphics cards. The Oculus Rift and other VR headsets could drive more gamers to upgrade to expensive graphics cards going forward, further boosting NVIDIA's core business. NVIDIA's growth story may only be in the early innings, and for investors willing to pay a high price for growth, NVIDIA fits the bill. But for those unable to justify the stock's nosebleed valuation, Qualcomm is a safer bet, despite the company's current struggles.